Soy sauce prohibited! 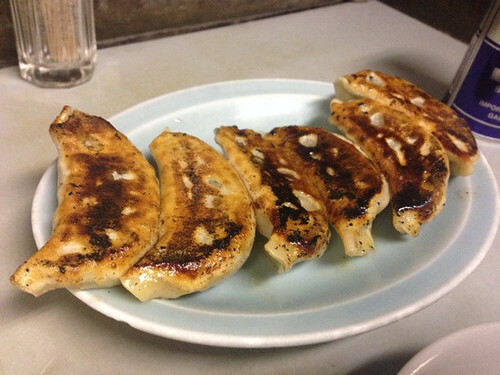 Gyozas of “Min-min” at Akasaka should be eaten with vinegar and pepper. There are many Gyoza restaurant named ‘Minmin’ across the nation in Japan. 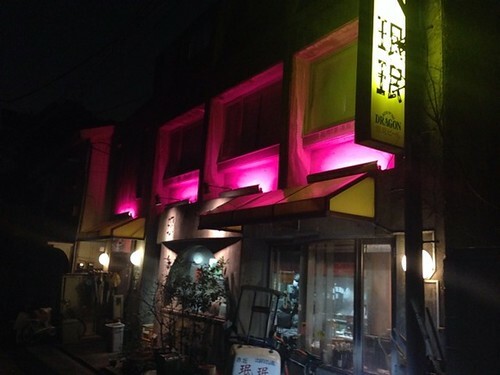 The origin is legend of ‘Minmin Yo-Ro-Kan’ that was built in Shibuya Koibumi Yokochou in 1952. Now that restaurant was closed, but ‘Minmin’ that we introduce today is said to be direct line of that restaurant. 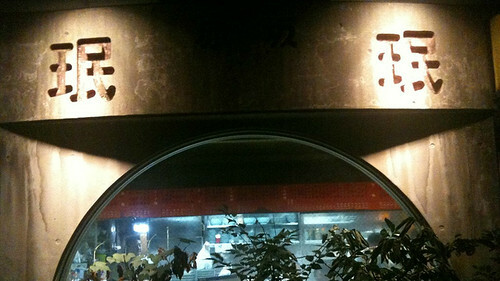 The restaurant is located a bit more than 10 min by walk from Akasaka, Nogizaka, and Aoyama-ichoume station. When you enter this restaurant and sit down, let’s order Yaki Gyoza, pan-fried Gyoza, immediately. You need to pay attention after ordering. Generally speaking, the sauce for Yaki Gyozas mixed Soy sauce, vinegar, and chili oil. However if you use a small dish for preparation for sauce with soy sauce, the landlady popular in the restaurant would say ‘You don’t know how to eat our Gyozas?’ to you immediately. We don’t use soy sauce and chili oil here. Then, what is the way to eat Yaki Gyozas in ‘Minmin’? 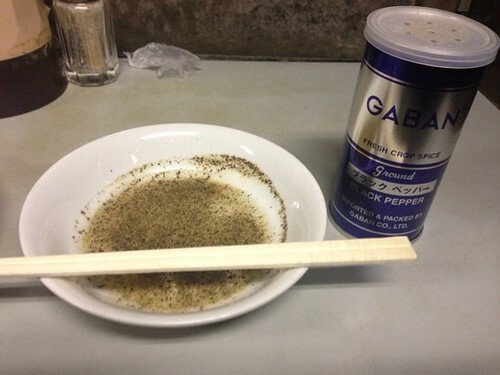 We eat with sauce with vinegar and pepper. The pepper is put on dumplings between 10 and 20 times. The finished image is like this. If you show embarrass yourself, impatient landlady helps you. After 10 min waiting, you can have pan-fried gyozas. They are cooked very crispy. It is slightly larger than normal ones. Please eat one bite without any sauce first. The juice of pork will overflow into your mouth from the gyoza. Then, please eat the second one with vinegar and pepper. You’ll notice the taste of the meat out-stands more with vinegar and pepper. Vinegar is said to give the effect for the tang to taste of other flavors with making film of the oil molecules on the surface. 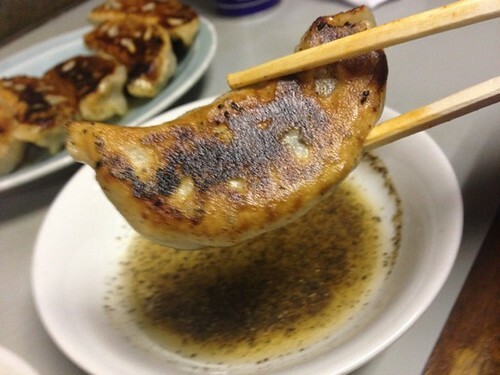 Miso Gyoza is also recommended after yaki Gyoza. Boiled dumplings are sinking in meatful miso soup. Scoop out a spoonful of meat-Miso, and eat it with the dumplings; ther’re excellent. Meat-miso on white rice is also recommended. 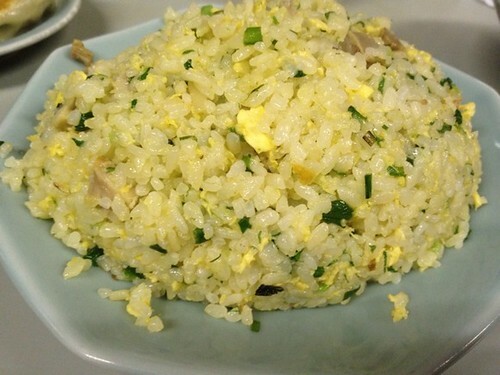 For the final dish at Min-min, Dragon fried rice is the must-have. 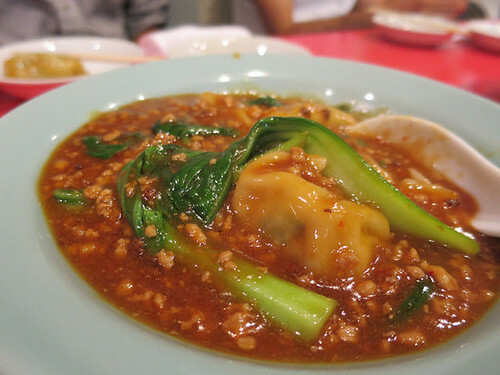 Most customers order this dish, for it is a popular menu of this shop along with fried dumplings. It’s very delicious, but one problem is the odor of your mouth because of garlic. It will remain until the next day for certain, so it might be good for you to be careful if you’re having a date or a meeting the next day.